The Acura CL was introduced in 1997, and later versions were launched in 2001. The Acura CL was considered as one of the best cars manufactured by the car company Acura back then. 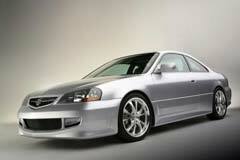 Since they were quite popular one will be able to find a used Acura CL quite easily. This 2-door coupe was quite stylish in its own way. They used to be produced in 4-speed automatic and 5-speed manual versions. The 4-cylinder and 6-cylinder CL also had “Premium” options including leather upholstery, heated front seats and different spoke designs. The second generation of the Acura CL that was produced between 2001 and 2003 came in 5-speed automatic and 6-speed manual transmissions. Various cosmetic changes were introduced at this time, including new side mirrors and a changed center console lighting. The door handles and the grill were made body colored and there were also new headlights and updated spoke wheels. Thicker exhaust pipes were also added in the 2003 Acura CL.